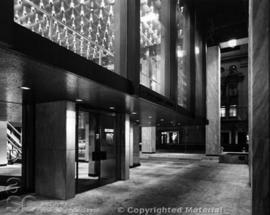 File consists of photographs of the interior and exterior of the CIBC located on Bloor and Dufferin. File consists of photographs of the interior and flooring of the CIBC Cafeteria. File consists of photographs of an architectural model by Page + Steele Architects. 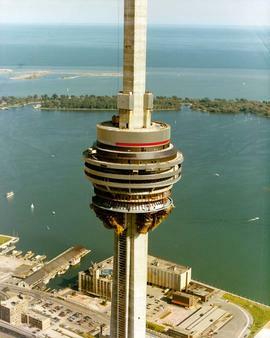 Exterior views of the CN tower and downtown Toronto. 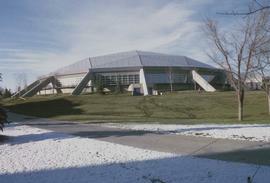 Exterior views of the C.N. Tower, Toronto. 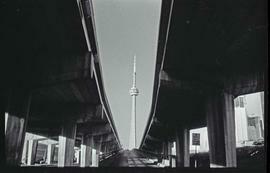 Photographs of the CN Tower before, during and after construction. Mainly aerial views of exterior. Exterior views of a concrete footbridge with the letters "C N I B" attached to the side. Located near Sunnybrook Hospital, over Bayview Avenue in Toronto. 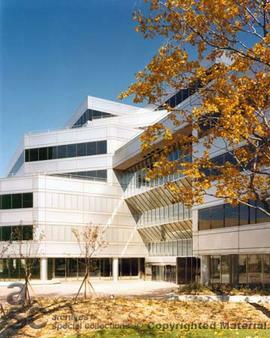 File contains photographs depicting interior and exterior views of the CSA office building. File contains photographs depicting interior views of Caban retail store. Different types of product displays are thoroughly documented. File contains photographs depicting exterior views of Caban home and lifestyle retail store. Item is a cabinet card portrait of a baby. File consists of photographs of various cabinets and architectural plans. File contains photographs depicting interior and exterior views of the Caledon Centre for Recreation and Wellness. Interior and exterior views of a two storey residential home. Interiors and exteriors of a multipurpose community facility. Photographs of a single-storey residence in a large, grassy property, with interior views of the kitchen area. Item is a plaque featuring an image of a woman on a horse at the Calgary Stampede. A brass plate beneath the image reads: "THANKS / STOCKMEN'S CLUB / FOR YUOR SUPPORT OF / THE GREATEST SHOW ON EARTH". Confirmation ticket for Lillian Constance Orr from Holy Trinity Curch in Chatham, Ontario, and calling card for Mrs. Alfred E. Orr. File contains photographs depicting interior views of Calvin Presbyterian Church. Shots feature the foyer, which contains a white undulating ceiling and purple walls finishes. 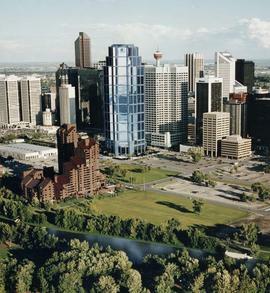 File contains photographs depicting exterior views of a high-rise building in an urban area. 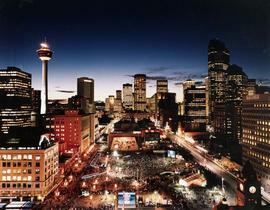 The building was owned by Camdev Properties Inc., which was amalgamated into O&Y Properties Inc. in 1997. File consists of photographs of a kitchen. Item is a small, horizontal camera with pop-up lens that covers viewfinder when closed. Black plastic body with rounded edges and an orange release button. Used 110 size colour cartridges, optimized for 200 film. Comes with packaging. Item consists of a oister featuring an image of a manufacturing warehouse. Beneath the image text reads "Camera Assembly - 1923". Side view, showing brick building set into the side of a hill. A note adhered to the verso gives the name, architect, owner, contractor and details about the judges' remarks for the building, which was submitted for a design competition. File consists of photographs of interior of the Canada Trust BCE building. 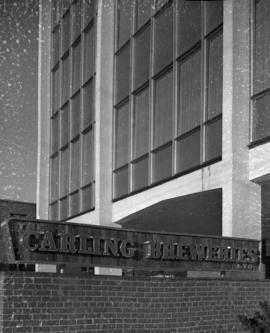 File consists of photographs of the interior and exterior of the Canada Life building. 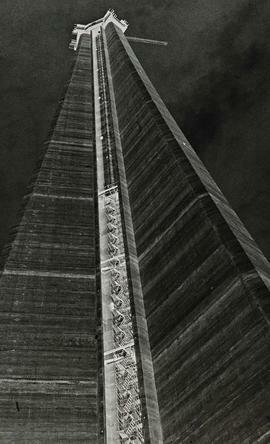 Archive photograph of the Canada Malting Company silos on Toronto's harbourfront. 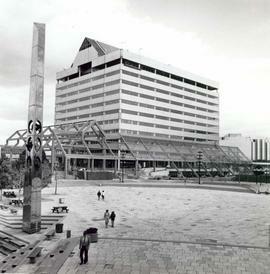 The image was published in a December 1994 article in Canadian Architect magazine about their re-use in a new project. Album is brown with embossed leather cover, brown fabric binding. White pages with window openings and gold borders. Contains 22 albumen photographs. Black cover and fabric spine. White notebook pages ruled in red and blue. Photographs mounted on pages with glue, on one side of page only. File contains portraits of various Canadian Blood Services employees. Their first names and other info have been recorded on an accompanying envelope. 4 photographs of design work by Jacques Rousseau (Canadian, born Saint-Hyacinthe, QC, 1948), and 1 unidentified photograph of a barn, partially destroyed. Canadian Centre for Architecture Exhibition Photos: "Cités de l'Archéologie Fictive : Oeuvres de Peter Eisenman, 1978-1988/ Cities of Artificial Excavation: The Works of Peter Eisenman 1978 - 1988"
Canadian Centre for Architecture Exhibition Photos: "Dieter Appelt : La catastrophe des choses/ The catastrophe of things"
Canadian Centre for Architecture Exhibition Photos: "Surface du Quotidien : La Pelouse en Amérique/ The American Lawn: Surface of Everyday Life"
Projection lamp bulb in original packaging (opened). 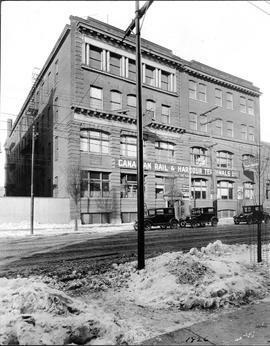 Item is an exterior view of the Canadian Kodak Co. Colborne Street location. File contains prints featuring exterior views of the Canadian Kodak Co., Ltd. Colborne Street location, with a Canadian Kodak Co. delivery truck parked in front. 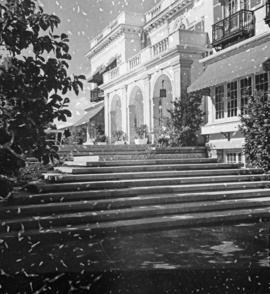 Item is a negative featuring an exterior view of the Canadian Kodak Co. Collborne Street location. 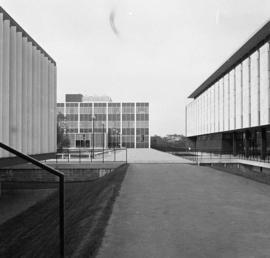 File contains negatives featuring exterior views of the Canadian Kodak Co., Ltd. King Street location. One building has a sign that reads "Canadian Rail & Harbour Terminals". File contains prints featuring exterior views of the Canadian Kodak Co., Ltd. King Street location. One building has a sign that reads "Canadian Rail & Harbour Terminals". Original label: "50 - Old delivery truck" from box 2. Item features an image of a driver sitting in a truck filled with wooden crates. The side of the truck reads "Canadian Kodak Co. Limited." Photographs show the interior/ auditorium of the Queen Elizabeth Theatre as photographed in April 1958 for an article on acoustics in theatre design, and the Shell Oil clock tower (also known as the Bulova tower). File consists of photographs of the Satok Mosaic at the Canadian Opera Centre. Item is a business card for Canadian Timber Structures Ltd., Engineering in Wood, presented by Charles B. Miller. Architect's model of a training centre and ski maintenance workshop. File consists of photographs of the interior of the Canoe Restaurant. Item is the rangefinder model of the Canonet 28. It has a CDS (cadmium sulphide) cell above the lens which is a Canon F2.8 40 mm. It has a Canonlite D flash attached to the hot shoe mount. File consists of photographs of the interior of a joint Capezio and Davids store. File consists of photographs of various car bumpers. File consists of 2 contact sheets and a print featuring images of Carl Seeley in engineering at the second floor of the Kodak Heights Building #7. File contains a certificate from Carleton University's Chancellor, President, and Senate to commemorate President Lachemi's installation. File contains a certificate from Carleton University Chancellor Charles Chi and President, Vice-Chancellor and Senate Chair Roseann O'Reilly Runte to Ryerson University to commemorate Chancellor Bloomberg's installation. Album is purple embossed leather cover with metal clasps. Spine missing. White pages with gold borders around window openings. Contains 26 albumen photographs.